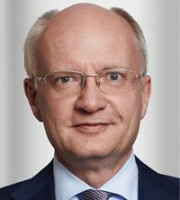 Wolfgang Kellenter works from Hengeler Mueller’s Dusseldorf office and is head of the firm’s patent litigation group and co-head of the IP practice group. He was admitted to the German Bar in 1990 and as a solicitor in England and Wales in 1992. He joined Hengeler Mueller in 1995 and became a partner in 1997. Dr Kellenter’s main practice area is patent litigation. He advises and represents companies across sectors including pharmaceuticals, medical devices, telecommunications, information technology, data encryption technologies and consumer electronics. His work has included the enforcement of patents of a leading research-based pharmaceutical manufacturer against generic companies as well as patent litigation regarding mobile phone standards such as LTE and UMTS. Dr Kellenter is a graduate of Bayreuth Law School, holds a doctorate (Dr jur) from Bayreuth University and obtained an LLM from the London School of Economics and Political Science. He lectures on IP law at the Dusseldorf Law School and Heinrich-Heine-University Dusseldorf, has authored several articles on patent law and regularly lectures on international patent law topics. Dr Kellenter is a member of the European Patent Lawyers Association, the German Association for the Protection of Intellectual Property, the International Association for the Protection of Intellectual Property and the Licensing Executives Society.